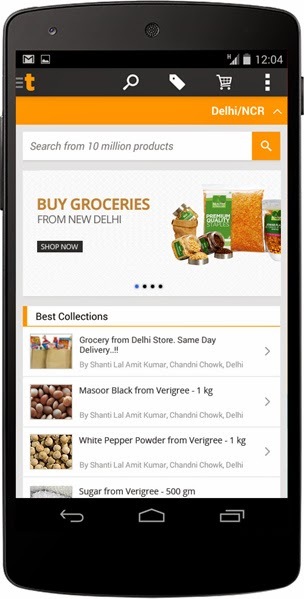 ibiboGroup owned Tradus.com, India’s fastest growing location-based mobile marketplace introduces grocery delivery by local sellers. Consumers can order their daily needs such as dal, rice, sugar, tea to dry fruits from local sellers all via Tradus mobile apps (android, iOS or windows phone). Buyers will get deliveries within hours, ensuring freshness and reliability of goods. ibiboGroup: "The launch of groceries is in line with Tradus' strategy of augmenting local deliveries of long tail products on mobile platform. Delhi is the first city where we have launched groceries. We will expand the same to other cities and sellers shortly." Besides convenience and fast delivery, price and quality are going to be the core drivers for this category. For example, 1 kg of sugar is being sold by a seller from ChandiChowk at Rs 29. Similarly, the sellers have priced branded Atta at a discount of 20%. Tradus is India's first location-based marketplace on mobile launched by ibiboGroup. We are MOBILE FIRST. We enable local real world retailers and sellers to transact with buyers in the same location. Tradus has an industry-leading buyer protection policy and the sellers on Tradus offer Same Day Delivery to local buyers. Tradus has sellers from 50 different categories ranging from the latest gadgets to exquisite hand-crafted jewellery - all in one shopping cart.